I'm so excited about the Terra Vegane Classic Cheddar Style Mac & Cheez, because I do love a good Mac & Cheese but finding one that's got delicious cheese alternative is something. I'm looking forward to trying this one because it'll be worth the delivery all the way from Berlin! PROPERCORN Smooth Peanut & Almond Popcorn, I love some popcorn, especially when it's only 120 calories, it's very guilt free. A very different peanut & almond mixture, very rarely have flavoured popcorn so it makes a change, it's not as crunchy as other brand popcorn, it's softer and the taste isn't overpowering, subtle and moreish. Hello! 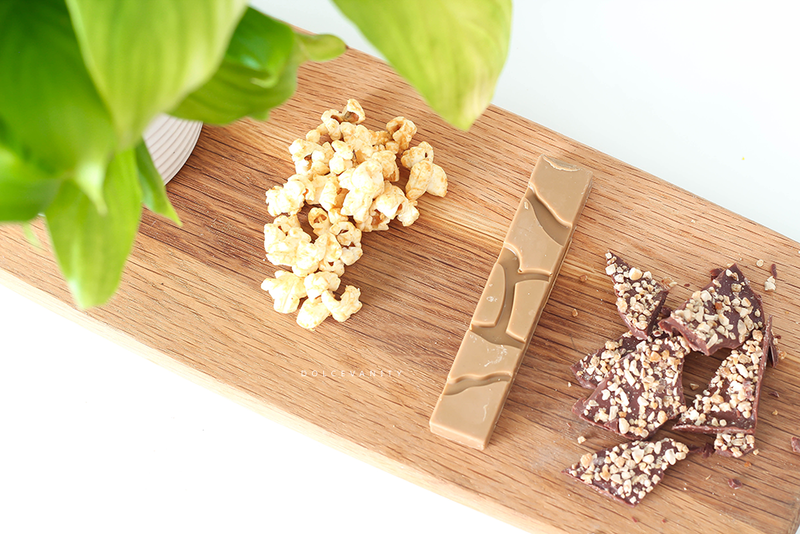 Moo Free Chocolate Caramelised Hazelnut Nibs Bar, I love nuts, hazelnut in chocolate - my favourite. They give a tip to break some of this on top of a smoothie bowl (which I need to try, I love the look of the smoothie bowl) Almighty Foods Golden Blonde Raw Chocolate Bar, is a diary free white chocolate alternative, truth be told the only white chocolate I use to eat was milky way but not often, chocolate can be quite sickly to me after a while. This one is a cashew cacao bar, as you can see it's golden blonde and it's flavoursome with notes of vanilla, caramel and butterscotch. It's processed at low temperatures making sure all the goodness is intact and you get the full flavours. I've not had milk in a good while, diary and me don't get on and sometimes I kind of miss having a breakfast cereal bowl, so this Good Hemp Milk Original has just been introduced to me, it's made from hemp seed, basically it can be used like you would of other milk, porridge, cereal, smoothie, tea or coffee and on it's own. This is 75% of your daily intake of omega 3 in this one carton, can't be wrong. I've been wanting to try hemp milk for a while so it's a good chance to see if this can be my replacement milk, it has a very fresh, green (only way I could describe it) taste. 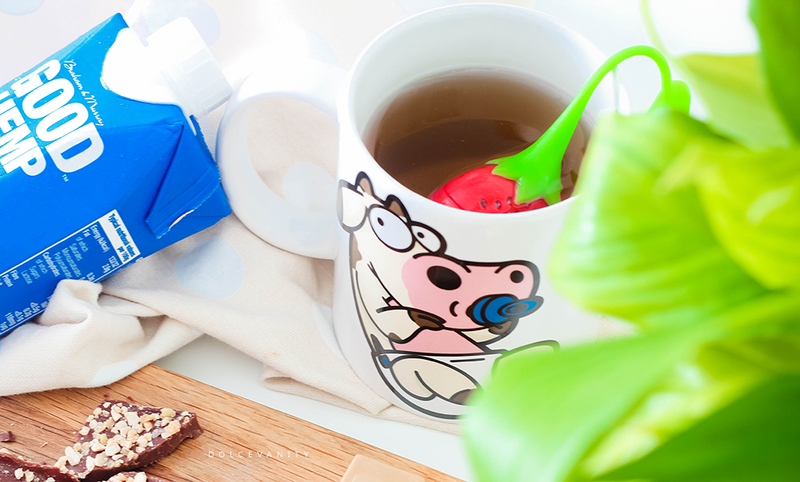 Plus what a better way to indulge in a warm drink of any kind than with this TheVeganKind 'Not A Baby Cow' Mug! HOW ADORABLE. This is a perfect gift for vegans, so make sure to look out for it in TheVeganKind shop soon!!! All the products are new to me, but they would be worth a try. Especially, as I am looking for healthier alternatives. Yeah it's good to have some healthier options here and there if you don't have a plant based diet. I have recently had to switch to dairy free so i love all of your suggestions. I hope you do a post on the mac and cheese as it sounds amazing! I'm so glad this post has been able to help you. Hemp milk is a good place to start I feel. 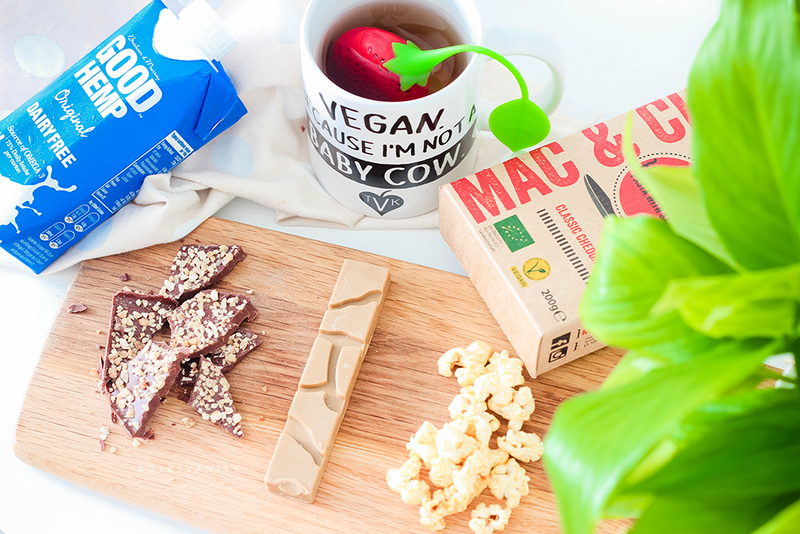 I am all about the Moo chocolate and the popcorn. Great snacks that look really well made, hate it when brands skimp because of calories or ingredients. I know what you mean, you don't feel you're getting your monies worth with things like that. I'd be pretty curious to try out the mac and cheese. The chocolate snacks sound good too! I did eventually try out the mac & cheese, wasn't too keen on the cheese unfortunately. I've never tried these, but they look totally yummy! I love the strawberry tea diffuser too! Aw thanks. The strawberry diffuser wasn't included in the box unfortunately but the mug totally was - yay! I love peanut butter so the propercorn sounds lush and I do like the sound of that mac and cheese as well! It's worth a try especially if you love peanut butter. OMG really, peanut butter and almond popcorn???? I need to try that. Great to hear it's guilt free. Thank you for your comment Joanna, maybe one day you'll come across these to try. I've been meaning to try this box for so long, I'm subscribed to their email list! Ah amazing. I'm also subbed to that, nice to find little tips and see what's new happening. This sounds like a great box, the almond and peanut popcorn sounds delicious! It totally was :) nom! That tea diffuser is so cute. I have loads already, but I always need more! Never heard of any of these, but what a cool mug! I love the mug, super cool and great designed. That mug is awesome. Looks like a great box of products. I really love the mug, seems to b a hit product. ive not tried any of the products but i am intrigued! especially that propercorn! The Propercorn is nice thats for sure. I've never tried any vegan alternatives to be honest, I find it interesting that there is so much choice. There is so much on the market now it's amazing and very positive. I love the Vegan Kind boxes. I've been vegetarian for 11 years now and thinking of going vegan. Amazing. They're so good and amazing to help you to transition I feel. I tried hemp milk it was ok in cooking or adding to recipes but I did it like it with cereal. I've not tried it in cereal yet, cooking I have I suppose the taste boils out with the food. I've always wondered what hemp milk would taste like, and I look forward to reading what you think of the mac and cheese! Yeah I kept saying like grass lmao and my nan said how often have you been eating grass! Your pictures are so amazing I'm starving rn ! I'm not a vegan, but some of the things in the box sound really tasty! Great mug too!